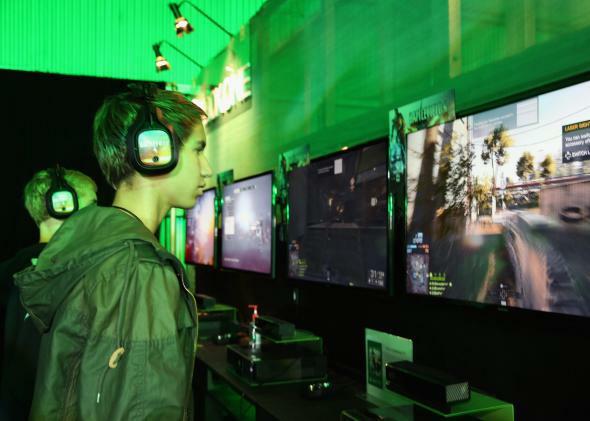 Xbox One, PlayStation 4 Games Punish Players for Swearing. WTF? The Xbox One hears all. It sees you when you’re sleeping. It knows when you’re awake. It knows if you’ve been bad or good, so be good, for Xbox’s sake. Microsoft’s new video game console, the Xbox One, has been greeted by privacy hawks as a “twisted nightmare.” The impressive Kinect technology that powers it can sense your motion, recognize your voice, even monitor your heart rate by training its infrared cameras on you. But the real nightmare may be when the console makes you wash your mouth out with soap. A YouTuber named randomfrankp has uploaded a video that appears to show NBA 2K14 slapping him with a technical foul for cussing. That is, his player on the court gets penalized because randomfrankp said the F-word aloud in his living room. These instances of video-game tsk-tskery may set off your fakedar, in this age of Internet hoaxes, but game-maker 2K says they’re real. And as fans of the NBA 2K series know, this isn’t even new. And sorry, Sony fanboys. The Xbox One isn’t the only spy in your living room. The PlayStation 4 version of NBA 2K14 will also penalize you for cussing, via the microphone on the PlayStation Camera. Your living-room Big Brothers are always listening. 2K’s innovative use of the sensory arrays accompanying the new generation of consoles is well-intentioned, and kind of funny, but we don’t play video games to be scolded; we play them to escape the world of scolds.